News of another price reduction arrives as Alex Braden and Matt Albert at Yachting Partners International see their joint central agency, the 43.15m motor yacht Ramses drop by $2.6 million. Ramses was built by Feadship to a Bannenberg design and launched from the De Vries yard in 1981, then refitted in 1996. This superyacht can accomodate 14 guests in four double and two twin cabins. She has D398 Caterpillar engines which give her a cruising speed of 12 knots and a maximum speed of 15 knots. 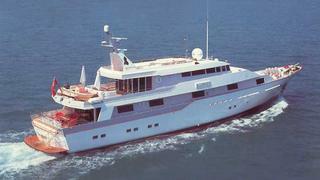 Ramses has had only three private owners since launch and is now listed at a new asking price of $6.9 million.